Item 016 - On the beach, Lake Nipissing, North Bay, Ontario, 1. 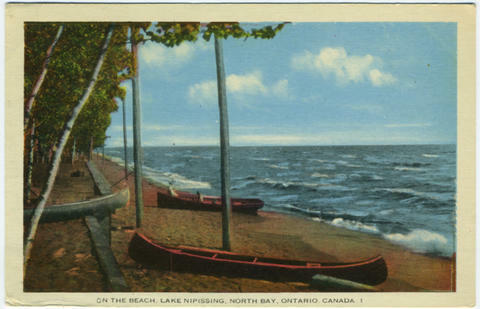 On the beach, Lake Nipissing, North Bay, Ontario, 1. Item is a postally used postcard depicting 2 canoes and 1 rowboat on a beach. Postcard was cancelled at Callander on 30 July 1941. Addressed to: Miss Winifred VerSoy. 1623 St. Charles. Lakewood, Ohio. U.S.A. Message reads: Wive seen mountains here too - but not like Tennessee. Hope to see the "Quins" tomorrow. Fishing is swell - lots of big ones! Love, Doris.